Personal information is information that identifies an individual or is directly associated with a specific person or entity such as a name, address, telephone number, email address or information about activities which can be directly linked to that person, such as his or her purchases. Our definition of personal information does not include "aggregate" information. Aggregate information is data we collect about a group or category of products, services or website visitors, from which individual identities have been removed. In other words, information about how you use a service may be collected and combined with information about how others use the same service, but no personal information will be included in the resulting data. Likewise, information about the products you purchase may be collected and combined with information about the products purchased by others. Aggregate data helps us understand trends and online visitors needs so that we can better consider new products and services, and tailor existing products and services to our clients' desires. We may automatically collect some information when you visit our website, such as your computer's network address and operating system, the site from which you linked to us, your site activity and the time and date of your visit and purchases. This information may be collected through the use of "cookies" (see Online Specifics below). We also receive information from third parties who provide services or special promotions or products and we may combine this information with the other personal information we maintain about you. In either case, this policy statement governs this information. In addition, we may use or disclose personal information in the good faith belief that we are lawfully authorized to do so, or that doing so is reasonably necessary to protect you, to comply with legal process or authorities, to respond to any claims, or to protect the rights, property or personal safety of Broadwaybakery.com, our clients, our employees or the public. We collect, process and maintain payment information, in compliance with the data security rules adopted by credit card companies such as Visa, MasterCard and American Express. This means that we do not retain debit card PINs or credit card security codes, and that any time we maintain a credit card number, such as when you create an online account, we use access controls and strong encryption to protect it. Further, when you enter personal information online, that information is encrypted using a security protocol called SSL (Secure Sockets Layer), which encrypts all information prior to transmitting it over the Internet. We also use SSL to allow you to securely view your online account and registration information. Online account information is accessible only by using a password. To protect the confidentiality of personal information in your online account, you must keep your password confidential. You are responsible for all uses of www.broadwaybakery.com by anyone using your password. If others have access to your computer or email, they may be able to find your password and obtain information about you (such as your address or phone number), or change information in your user profile. You should not use an email account operated by an employer because many employers have the legal right to view your email or online accounts. Please advise us immediately at customerservice@broadwaybakery.com if you believe your password has been misused. 1. If you do not want us to share information with third parties, you can: (a) call our customer service representatives at (UAE): (04) 224 8800; (b) email us at customerservice@broadwaybakery.com; or (c) write us at: Emirates Towers, Level 41, Sheikh Zayed Road, P.O Box 31303, Dubai, United Arab Emirates. 2. 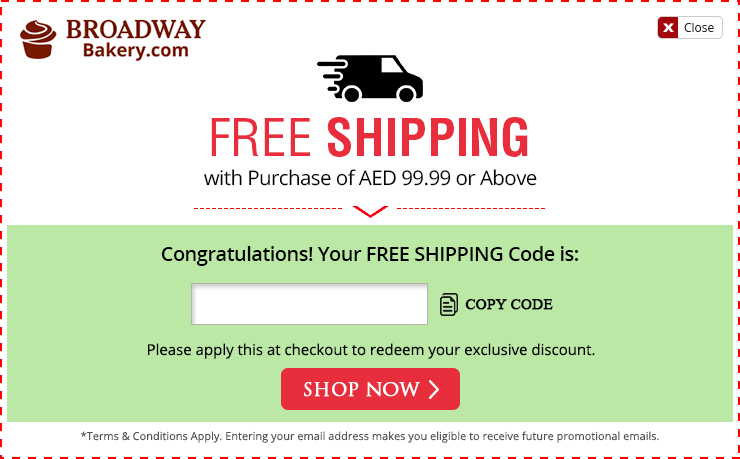 If you do not want to receive Promotional Information (see Use of Personal Information by Broadwaybakery.com) or information about related services, you can: (a) call our customer service representatives at (UAE): (04) 224 8800 (b) email us at customerservice@broadwaybakery.com; or (c) write us at: Emirates Towers, Level 41, Sheikh Zayed Road, P.O Box 31303, Dubai, United Arab Emirates. 3. If you do not want to receive promotional emails or sms, you can: (a) call our customer service representatives at Call Us (UAE): (04) 224 8800; (b) email us at customerservice@broadwaybakery.com; (c) write us at: Emirates Towers, Level 41, Sheikh Zayed Road, P.O Box 31303, Dubai, United Arab Emirates. or (d) click on unsubscribe from our promotional emails or sms. While cookies are optional for browsing Broadwaybakery.com, they are required for registering, logging on, shopping or adding items to your cart. If you wish to purchase items or set up an account on broadwaybakery.com, you will need to accept a Broadwaybakery.com cookie. We encourage parents to take an active interest in their children's use of the Internet. We do not intend to collect information from children who are under 18 years of age. If you are under 18, you should not provide information on the Broadwaybakery.com Website and should ask your parent to do so for you. Information we automatically collect as a result of your online activity is generally not retained in a personally identifiable form. The exception would be information we need in order to investigate fraud or problems associated with particular transactions or events. 3. Write us at: Emirates Towers, Level 41, Sheikh Zayed Road, P.O Box 31303, Dubai, United Arab Emirates. The Analytics Demographics and Interest Reporting feature allows us to collect data relating to the demographics (age and gender) and interests of visitors to our site. We collect such data to analyze how visitors engage with our website to develop the site and content around our users' interests.. We do not collect or store personally identifiable information about visitors. We will use the data provided by Analytics Demographics and Interest Reporting to develop the site and content around our users' interests.